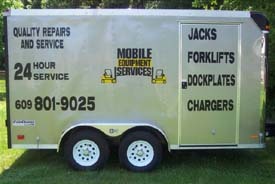 Welcome to Mobile Equipment Services, presently serving Burlington county NJ and the surrounding community. Your single source for Material Handling Equipment Service you can count on. 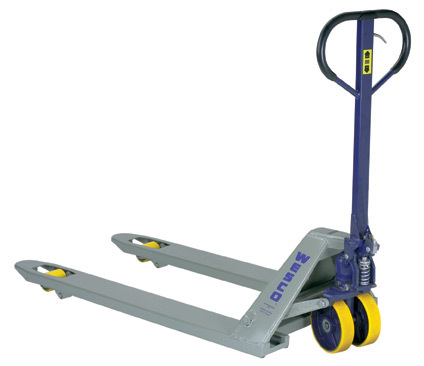 We can meet the needs of your Material Handling Fleet and related Industrial Equipment. We service all makes and models of forklifts: Electric, Gas, LP, and Diesel. Including Rider and Walk-behind Jacks, Industrial Batteries and Chargers. If the situation should arise, 24 Hour Emergency Service is always available. 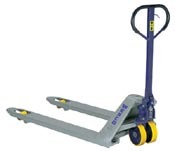 We also stock Quality used forklifts for Sale or Rental. If we don't have what you need, our network of wholesalers can help us locate it for you. For your Warehousing Equipment needs ie. Pallet jacks, Drum Equipment, Stackers, Carts, etc... We are a distributor of quality Wesco Industrial Products. Contact us for a catalog or visit their website at www.wescomfg.com and we will gladly give you a quote on the equipment you need. Our mission is to provide the highest quality repairs and service to keep your operation running as smoothly and cost effectively as possible. On site Hydraulic hose fabrication and Battery repair in practically all situations. We bring it all to you in our fully stocked mobile repair shop. Mobile equipment service stands ready to serve your Material Handling Equipment service needs. No one guarantees their Maintenance services or repairs to your Material Handling Equipment like Mobile Equipment services. We have the Tools, Knowledge, Pricing and Warranty. By combining the guarantees of our Preventive Maintenance Program and replacement Parts, you can virtually eliminate travel charges. For more information on how Mobile Equipment services can help you save on your Material handling Equipment budget, please contact us at 609-801-9025. Our average savings versus OEM dealers is 30%.